Wow, it’s been so long since I visited and so much has happened. Sorry to everyone about the break. I got a lovely note from Samantha on twitter who requested Up and Ratatouille and I’ve finished off all the movies so I am posting Up today. 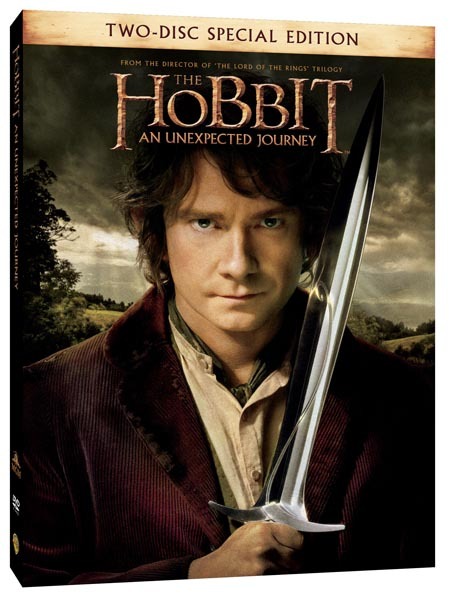 For this movie night my son turned had just turned seven, his official birthday, not the Hobbit party! 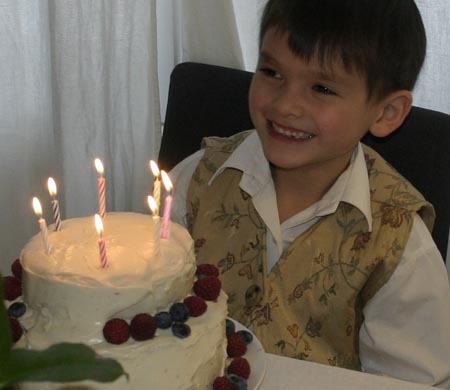 And now he is eight! How did that happen? I swear I just brought him home from the hospital a few days ago! We did Up for our movie night (his choice). 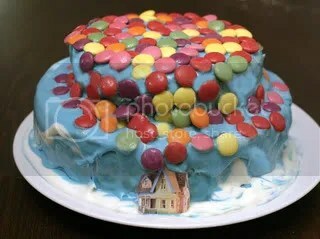 I looked for grape pop in bottles but I had no luck so we did a birthday cake covered with smarties for the snack. 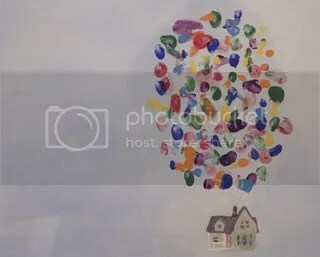 For the craft, we did a canvas with a blue background and a little tiny house painted on and my son held the baby as he blobbed his fingers in a rainbow of colours to make the balloons. The colours in the photo are not reproducing that well here. It was a very quiet birthday, I called it his “do whatever you want day” (I got the idea from his aunt). We had his favourite pizza for dinner and he played chess, lego and wii. His grandfather came and gave him walkie talkies for the park at Disney. He also got a copy of Spiderwick and some Ninjago Lego from us. Happy Birthday darling boy! My son and I also made a dozen of these Ellie badges for all of my family on the trip, in memory of my mum. I just laser printed a bunch of grape pop logos and applied them with Mod Podge to bottle caps we had tapped two little holes in with a hammer and nail. We did a few coats to keep them from getting scuffed and then we just threaded a medium safety pin into each one. Here is a link to the video of the trip, the music goes perfectly with this post. A little extra fun, a gingerbread house we decorated in the house colours. Much fun was had by all kids eating it and playing with the balloons afterwards. This year we had a Hobbit party for my son for his 7th birthday. I was so busy with getting ready I didn’t get to take nearly as many photos as I would have liked. We had a “No admittance except on party business” sign on the door, flowers and and a birthday banner, and a table groaning with food. 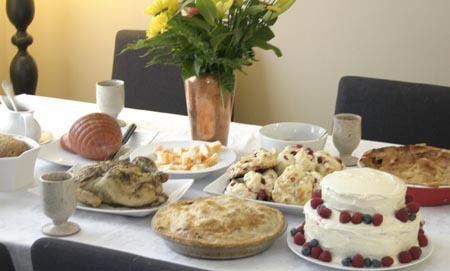 The menu was from the book’s “an unexpected party” chapter: Seed cake from here, scones from here with raspberry jam, apple pie from here, mince tarts from here, cheese and pickles, ham, pork pie from here, cold chicken, plus a giant birthday cake like the one from “The Lord of the Rings”. I’ve put all the recipes at the bottom of the page. We made a “Smaug the terrible” piñata filled with chocolate gold coins. 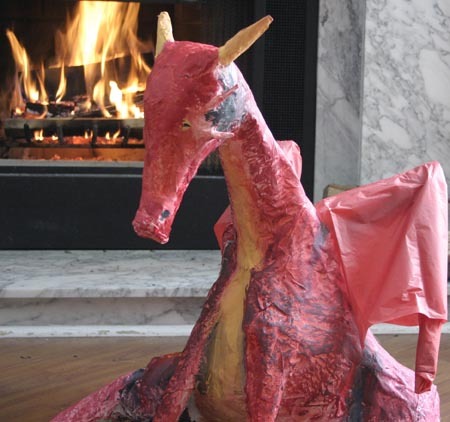 To make Smaug I taped several balloons together for the body, a long thin balloon for the tail, and used rolled cardboard for the horns, wings, forelegs, snout, spines and horns. I covered it all with two layers of newspaper dipped in paste. When it was well dry, we painted it with acrylic paint and covered the wings in red tissue paper. We filled him with lots of chocolate gold coins and the kids all got a turn battling with him before he got a small hole in the bottom and gave up his horde. My son fell in love with him though so we ended up having to keep him once the battle was done. Loot bags were treasure chests filled with the coins and small lego hobbit sets, it was a huge success! We had also planned for the kids to play “riddles in the dark” with gold rings my husband had “forged” but the kids were too busy playing so we just handed them out. To make them we took a package of kids toy rings from the dollar store, cut off the jems, sanded and spray painted them gold. They look fantastic. I had wanted to do fireworks but one small box was $50 and I was already at my budget’s limit and I was worried my husband was going to think I was getting carried away a bit (who, me?). 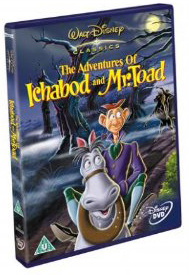 And what, you may ask, does this Hobbit talk have any business on a Disney/Universal movie night blog? Well, I’ll tell you! This! 1. Preheat the oven to 180°C. Lightly grease loaf pan. 2. Combine the poppy seeds and milk in a bowl and set aside for 15 minutes. 3. Combine the caster sugar and 185g of the butter until light and fluffy. Mix in the eggs. Fold in the flour gradually, alternate with the poppy seed and milk mix. Finally stir in lemon rind. Alternatively add the ingredients to an electric mixer. Beat on high for 5 minutes until the mixture is pale and thick. Pour into the pan and bake in the oven for 40 minutes or until a skewer inserted into the centre comes out clean. Turn onto a wire rack to cool. 4. Meanwhile, melt the remaining butter and place in a bowl with the icing sugar and lemon juice. Beat with an electric beater until smooth, then drizzle over the cake. 1. Preheat oven to 200˚C. 3. Shape into wedges or rounds, and place on the baking sheet. 4. Bake 15 minutes in the preheated oven, or until golden brown. 1. Preheat oven to 220˚C. Melt the butter in a saucepan. Stir in flour to form a paste. Add water, white sugar and brown sugar, and bring to a boil. Reduce temperature and let simmer. 2. Place the bottom crust in your pan. Fill with apples, mounded slightly. Cover with a lattice work crust. Gently pour the sugar and butter liquid over the crust. Pour slowly so that it does not run off. 3. Bake 15 minutes in the preheated oven. Reduce the temperature to 175˚C. Continue baking for 35 to 45 minutes, until apples are soft. 1. Preheat an oven to 230˚C. 2. Place apples, butter, and lemon juice into a saucepan over medium heat, and cook, stirring often, until the apples are tender, 8 to 10 minutes. Stir in sugar, cinnamon, nutmeg, and vanilla extract. 3. 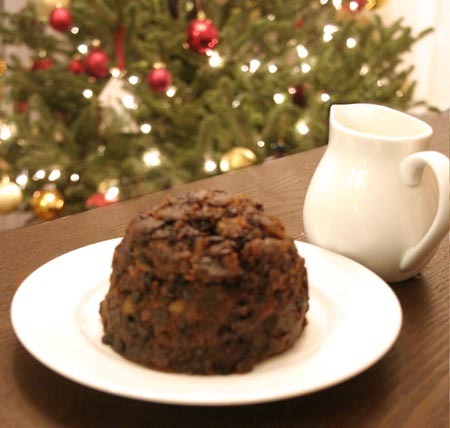 Mix in the mincemeat until thoroughly combined, and set the pie filling aside. Cut rounds from pastry (we used a latrge tea cup), place in muffin tins, and pour the filling into the pastry. Top tarts with a layer of crust (we did star shapes from a cookie cutter). In a small bowl, whisk the egg yolk with water, and brush the yolk mixture over the top crust. 4. Bake in the preheated oven for 15 minutes, then reduce oven temperature to 175˚C and bake until the crust is golden brown and the filling is bubbling, 20 to 25 more minutes. 1. Brown ground beef and ground pork over medium heat until thoroughly cooked. Drain off grease. 2. Mix together cooked meat, potatoes, salt, pepper, and nutmeg. 3. Line a pie dish with pastry. Spoon pork mixture into pie crust, and top with second pie crust. Brush top crust with egg white. Shield crust edges with aluminum foil to prevent burning. 4. Bake at 190˚C for 45 minutes. Remove foil for final 15 minutes of baking to brown edges. Just adding a little craft Toby did. 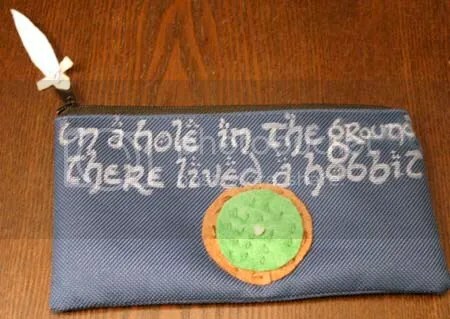 A pencil case for the first day of school. Just felt and fabric paint on a plain dollar store pencil case. 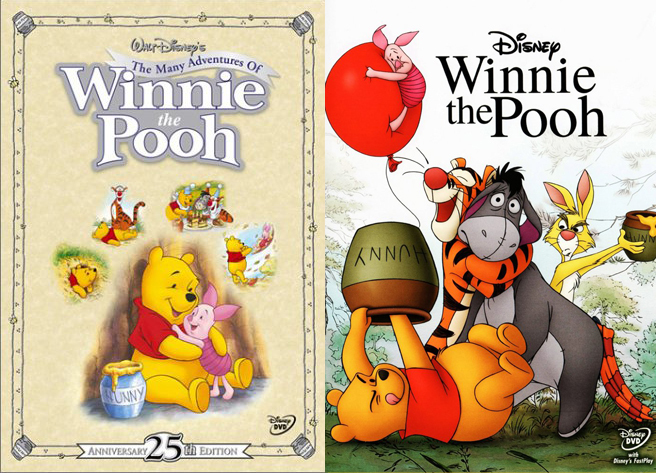 Here is our double bill The Many Adventures of Winnie the Pooh and Winnie the Pooh 2011 movie night. The sequel is actually quite surprisingly good and the kids couldn’t decide which they preferred. They thought the Backson was hysterical. It was more of a movie day because for breakfast we had a Crystal Palace breakfast of puffed french toast. We found the recipe here which I’ve posted below. So delicious but highly unhealthy so we went for a run after breakfast to make up for it. 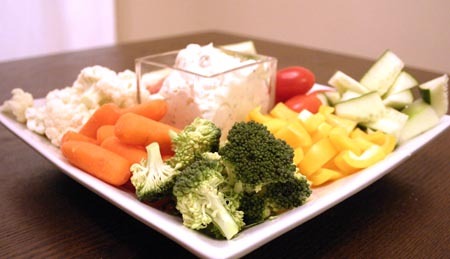 We had a nice healthy Rabbit’s garden for lunch to balance it out (carrots, cucumber, broccoli, cauliflower, tomato, zucchini and peppers with dip). 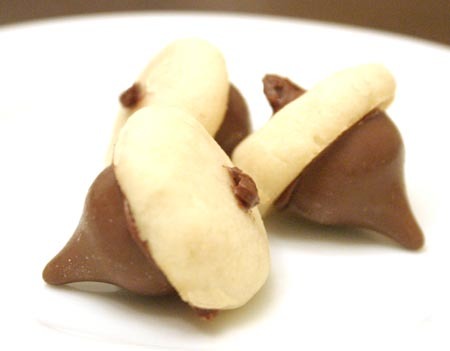 Snacks during the movie were haycorns (mini shortbread cookies iced together with a chocolate kiss). Just the perfect size for tossing in your mouth. A whole tray did not last long. I saw them here and I’ve posted the recipe I used below. 1. Preheat oven to 180˚C. 3. Roll out small balls of dough about the size of a loonie on baking sheets and press to flatten slightly. Bake for 10 – 12 minutes. 4. When cool, ice a blob of chocolate icing to the back of the cookie and attach a chocolate kiss. Ice a small stem on top with chocolate icing. 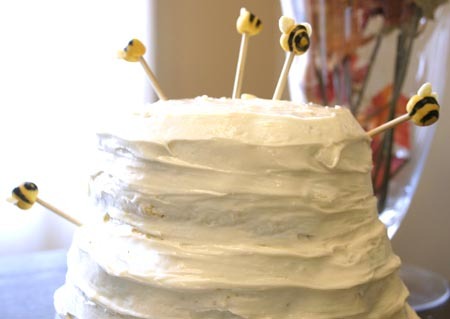 And for dessert, a beehive honey cake! I found the idea for that here with a beautiful verison but I made a lot of changes because of my daughter’s nut allergy. I made the cake and icing both honey flavoured (from a box mix), and I used fondant, instead of marzipan for the bees. I’d love to take a cake making class one day. I hate how my cakes NEVER look as good as the ones in the photos. The kids don’t seem to mind though! I’ve posted the recipe below. 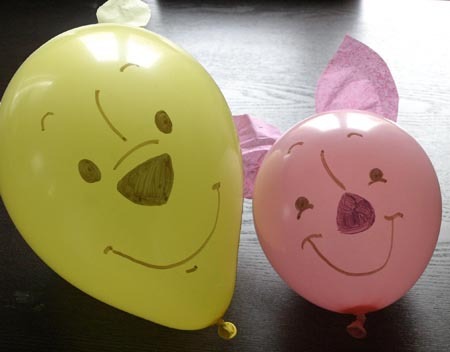 For the craft, the kids and I decorated balloons to look like Pooh and Piglet. Well truth be told, they blew up the balloons and spent the afternoon playing with them and they got me to draw the faces on. They did do the tissue paper ears though! You could also do a Tigger balloon too but our orange one popped before I realized that. 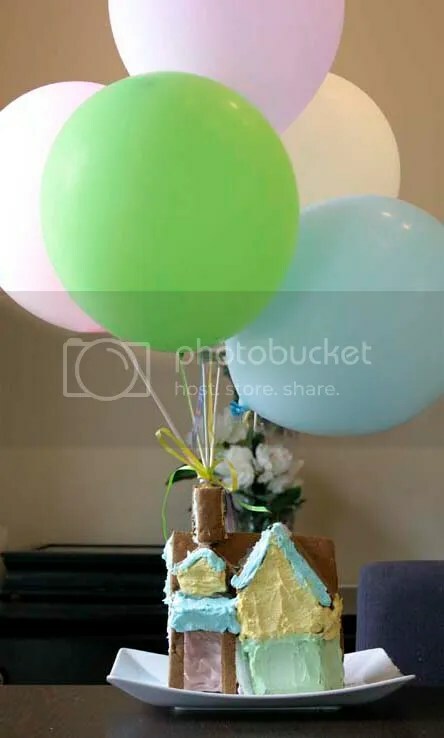 I got the idea here, all you need is a sharpie, some balloons, tape and matching tissue paper. 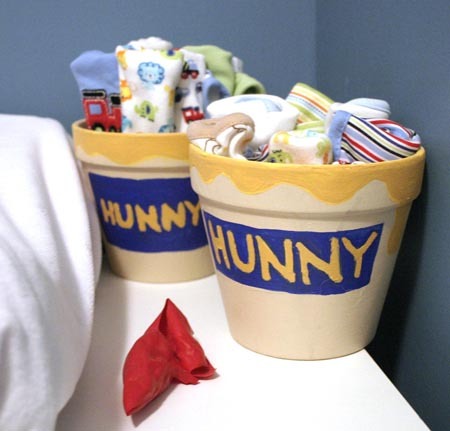 We also painted honey pots which we are using to organize bibs and face cloths in the baby’s drawers. You just need acrylic paint, a brush and a flower pot – easy! 1. First, pour the 187 mL sugar and 1 tablespoon cinnamon into a shallow glass dish. Stir well and set aside. 2. Next, cut each slice of bread diagonally into two triangles. 3. In a large bowl, mix eggs, remaining 37 mL of sugar, vanilla and milk with whisk until well blended. Slowly add the flour, salt and baking powder and stir until lumps are gone and batter is smooth. It will be appear similar to pancake batter. 4. Heat 1-inch of cooking oil in a deep frying pan. Test the oil by dropping a tiny bit of batter into it, if it begins sizzling it is ready. 5. Take a bread triangle and dip it into the batter, turning to coating both sides. Then carefully drop it into the hot oil. Using kitchen tongs, flip the bread over as soon as it puffs and turns golden-brown. Once the other side has cooked, remove it with tongs and place it on the empty plate with paper towels to let it soak up any excess oil. Move it on over to cinnamon sugar and roll until completely coated. 7. Sprinkle with powdered sugar, and serve with syrup, fresh fruit and whipped cream. 1. Butter and flour an 8-inch cake pan and an 8-inch metal mixing bowl. Line the cake pan with a parchment paper round. Set aside. 2. Prepare cake mix and add 125 mL honey. Divide the batter between the cake pan and the prepared bowl. 3. Bake until a tester comes out clean. The cake in the bowl may take a few more minutes. Remove and allow to cool completely. 4. Add 75 mL honey to icing. Divide in half and add yellow food coloring to the other. 5. Slice each of the layer in half, then fill the layers with the icing. Using a small amount of the yellow icing, create a crumb coat to lock in the crumbs and smooth the surface of the cake. Chill. 6. Put a thick layer of icing over the chilled crumb coat. Starting at the top of the cake, use a spatula and create a spiral by slowly spinning and moving the spatula downward. 7. To create the bees: Take a small piece of the fondant and roll it between the palms of your hands until it is lozenge shaped. Taper one end slightly to be the back of the bee. Paint the stripes on the fondant with a clean paintbrush and black food coloring. Allow it to dry until it is no longer tacky. Once the stripes are dry, press flattened balls of fondant into the sides to create the bees wings. While the baby was little the movie nights were more like movie weeks. Dinner one night, dessert another, then one or two days to finish the craft. Thinks are a bit easier now, he stood up for the first time on Mother’s Day for me! 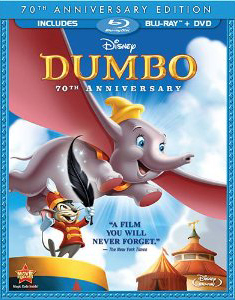 And Dumbo is the perfect movie night for a house with a new baby in it and the perfect Mother’s Day movie. For a circus dinner we had corn dogs, candy floss and popcorn balls. 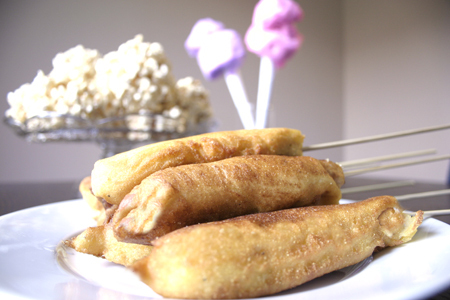 The recipe for the corn dogs is here. It makes a lot so I would freeze half of the corn dogs once you are finished. For the best effects we put the whole corn dog in the oil and then put the skewers on afterwards, and we used half regular hot dogs and half veggie dogs. 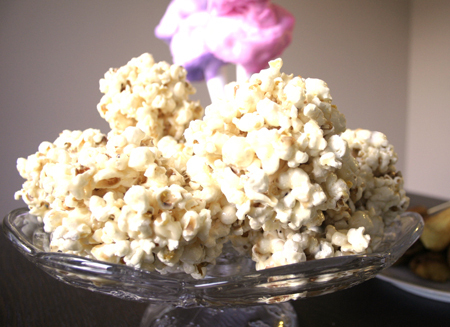 Here is the recipe for the popcorn balls but we used butter instead of margarine and only 1/2 a cup of marshmallows (some 6 years old ate all of ours when we last made s’mores – or smoes as we call them here – 5 points if you get that reference). I’ve put both recipes below. Caution: these are super sweet, you may want to pick up some insulin while you are out getting the ingredients! The kids LOVED them! Then we just bought some cotton candy at the bulk barn and made those little white cones with card stock to hold them. 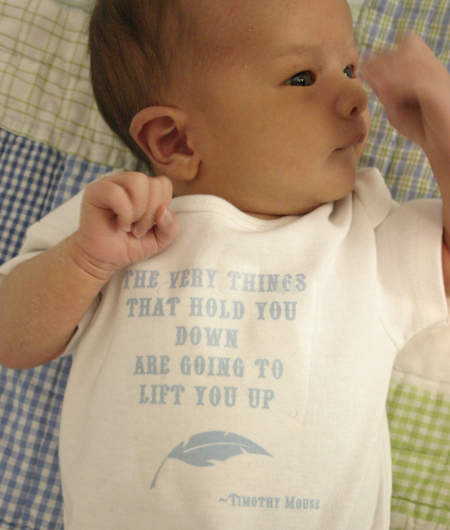 For the craft, my girl and I created an iron-on transfer for a onsie for the baby. The quote is “The very things that hold you down are going to life you up. 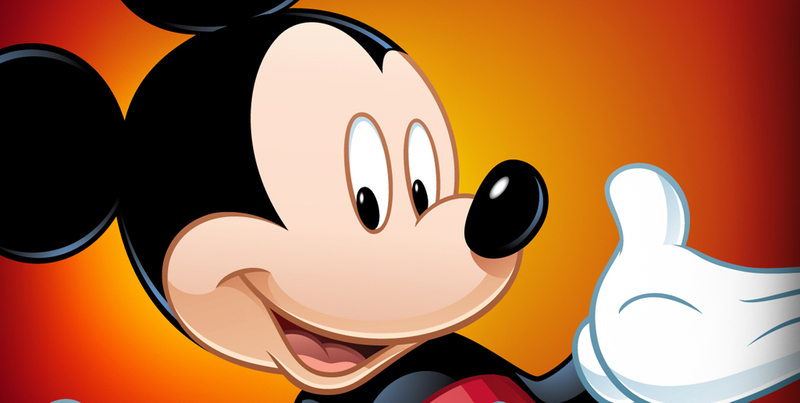 – Timothy Mouse” with some clip art of a little feather. Learning how to iron safely is always a useful skill for kids. Oh! He’s so tiny here! By the way, our iron-on transfers started to flake off so I had to wash this onsie and let drip dry when it needed cleaning but a friend tells me that this site sells good transfers that work much better than the ones you can find in stores. 2. Preheat oil in a deep saucepan over medium heat. Insert wooden skewers into frankfurters. Roll frankfurters in batter until well coated. 3. Fry 2 or 3 corn dogs at a time until lightly browned, about 3 minutes. Drain on paper towels. 1. In a saucepan over medium heat, combine the corn syrup, margarine, cold water, confectioners’ sugar and marshmallows. Heat and stir until the mixture comes to a boil. Carefully combine the hot mixture with the popcorn, coating each kernel. 2. Grease hands with vegetable shortening and quickly shape the coated popcorn into balls before it cools. Wrap with cellophane or plastic wrap and store at room temperature. 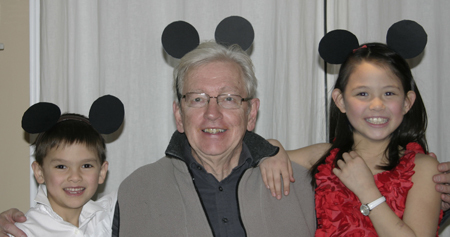 Almost everyone in our family is born in the same month so we had a big family party, and because almost everyone coming to the party is joining us in Disney, we had a Mickey theme. 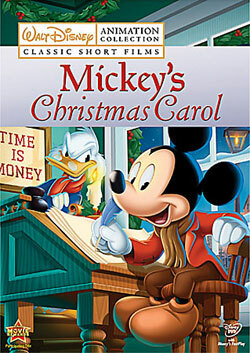 We had Epic Mickey 2 playing on the Wii for the boys and The Spirit of Mickey on the television downstairs. 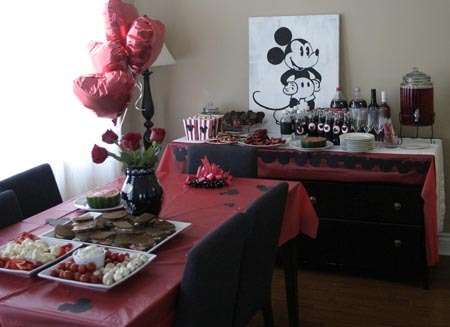 We decorated with red roses and balloons, and red table cloths and black mouse ear garlands made from black bristol board. I also have been planning a painting for the dining room for ages but I haven’t finished it yet so I took an old canvas and sketched out a vintage Mickey to hang in that space just for the party. 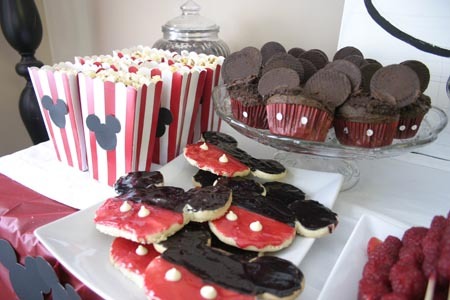 Dessert was mickey shaped cookies (iced shortbread with white chocolate chip buttons) and cupcakes (chocolate cupcakes in red cupcake liners with two white hole punch buttons, iced with chocolate icing and dipped in oreo crumbs, then two chocolate biscuits stuck in with extra icing for ears), cinnamon hearts, malt balls and candy sticks in an apothacary jar, and bags of popcorn. 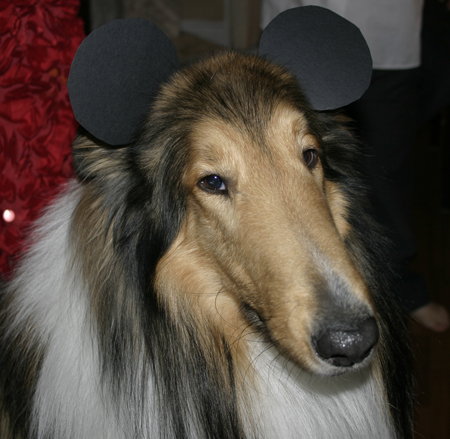 The craft was mouse ears and my daughter made them for everyone. Just rounds of black bristol boaerd attached to headbands from the dollar store (and red bows for Minnie) Unfortunately the baby hated them and screamed the house down when we tried to get a photo with Grandad. 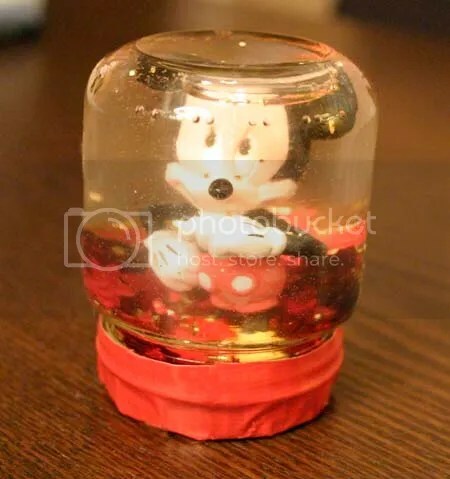 Just a little snow globe we made out of an old baby bottle, a mickey figurine, some metallic confetti and some glycerine and water. Oh, and we sealed the lid with crazy glue and wrapped it in red duct tape. 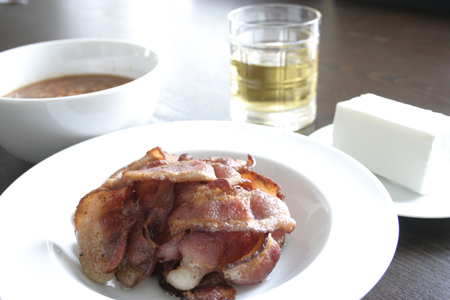 We did Atlantis on April fool’s meal because we did “beans, bacon, whiskey, and lard“. The whiskey was apple juice and the lard was white ice cream cut into rectangles. Only thing is, the kids had never seen lard before so they didn’t quite get it but my husband laughed! Pretty easy preparation, I don’t even have any recipes for this one. Just crack open a tin of beans and heat, cook some bacon, cut up a block of nut-free Chapmans’ vanilla ice cream, pour the apple juice and serve! 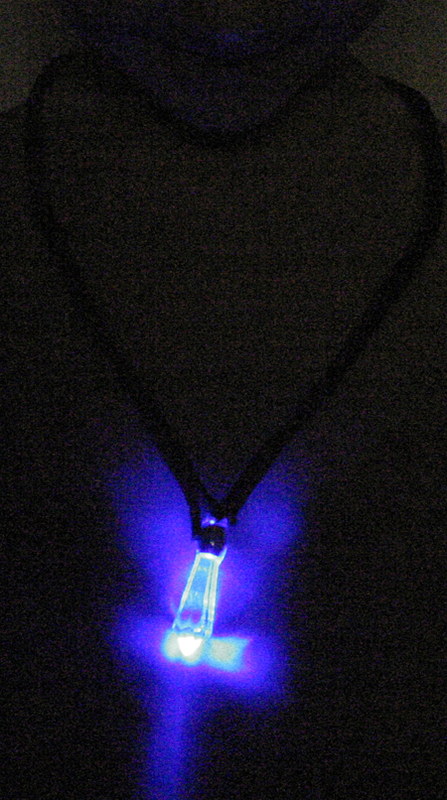 For the craft we did Kida’s necklace. I ordered a glowing crystal from China for a dollar or something crazy off of ebay. I got some brown leather necklaces from the dollar store and my son glued the crystal’s cord inside the leather. The cord was pretty fragile and it snapped (what do you expect for a dollar) so my son had fun learning how to help daddy rewire it! So we had originally thought to have a Hallowe’en party/movie night to introduce the baby to everyone in our family. 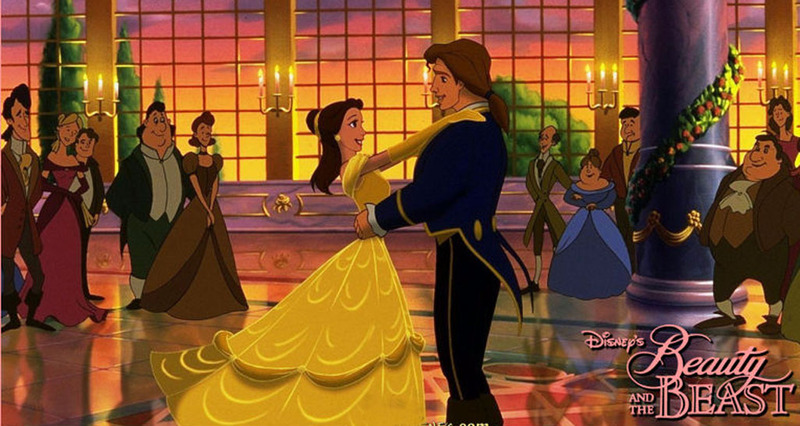 I wanted to cancel but the kids were so looking forward to it so my sweet, darling husband offered to make everything. I had purchased all the materials and ingredients before the baby was born so off he went. 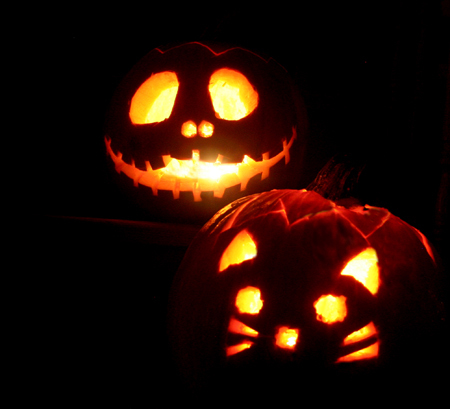 I spent the day feeding the bairn and he spent the day cooking, baking, and helping the kids carve pumpkins. He even knew that I wanted photos of the movie nights so he did that too! 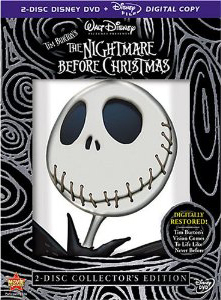 We never did get to watch the movies that day but the following Friday was a PD day at the school so the kids and I hung out and watched the double header (while I fed the boy) – the Haunted Mansion and the Nightmare Before Christmas. 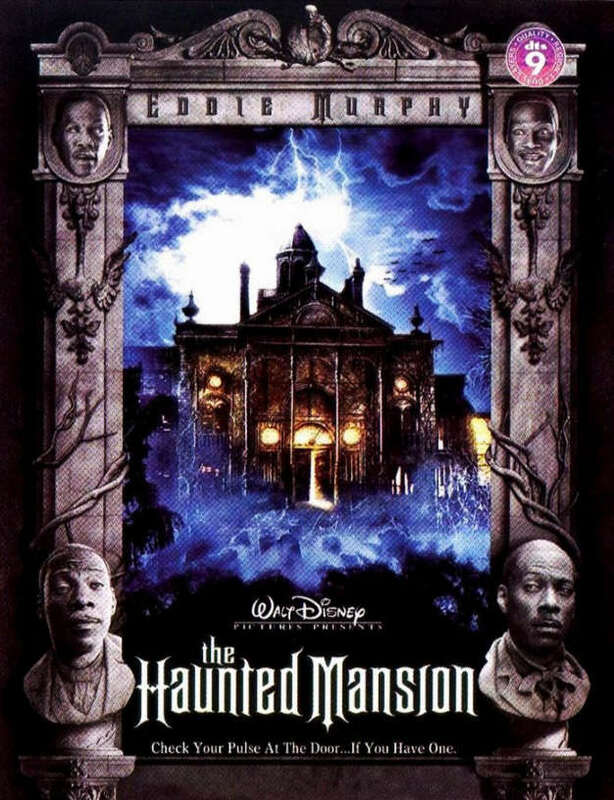 When I watched the Haunted Mansion when it first came out I thought it was dreadful but apparently if you are between the ages of nine and six, you are at the perfect age to think it’s pretty funny. I even laughed with them when Eddie Murphy meets Madame Leota. I am so excited for the new version of The Haunted Mansion that is (hopefully) coming out with Guillermo del Toro directing. 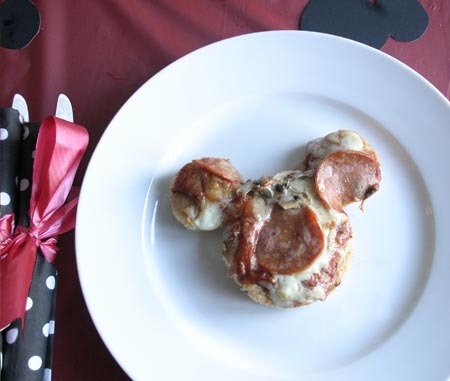 And in even more exciting news, we had to move our trip dates back a bit to suit everyone’s schedule so we will be at Walt Disney World this year during their Mickey’s Not So Scary Hallowe’en Party! 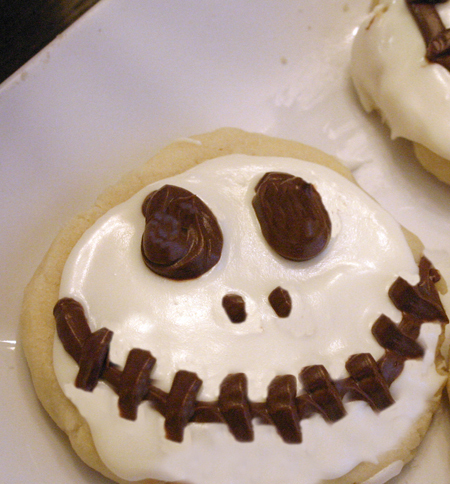 Here are the Jack Skellington Cookies baked by my husband. The recipe is from here but is pasted below. 3. Roll dough out on well-floured surface, cut into circles and transfer to baking sheets. Bake for 10 – 12 minutes. 4. When cooled, ice with vanilla icing, then decorate with chocolate icing in Jack Skellington pattern. 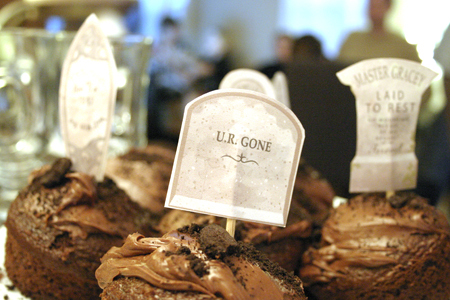 My brother in law printed out tombstones for the cupcakes my husband made and my son decorated. I found the artwork here. The chocolate cupcakes were iced with chocolate icing and then dipped in a bowl of oreo cookie crumbs (smashed beautifully by my son). 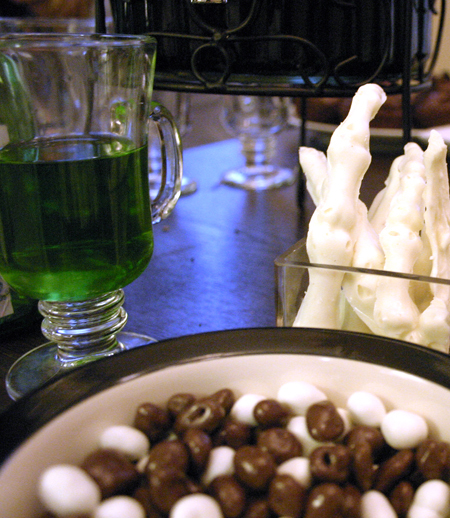 Poison (green tea crystal light with green food colouring), skeleton bones (white chocolate melted in a jello mold from the dollar store), and Zero’s kibble (chocolate and yogurt covered raisins in a dog food bowl). 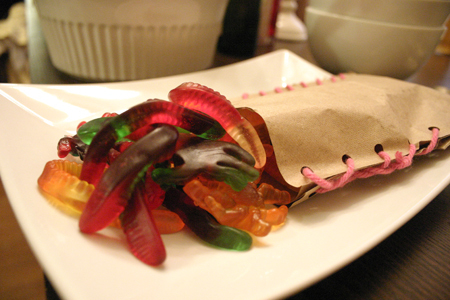 Oogie Boogie Guts (jelly worms and tarantulas) in a paper bag, sewn together by my daughter using wool. I got the idea for the guts and the kibble from this site. The crafts were pumpkin carving and haunted mansion bookmarks. The website for the bookmarks was here. And this website here has the other two portraits on it as well so the kids and my niece and nephew created all four. 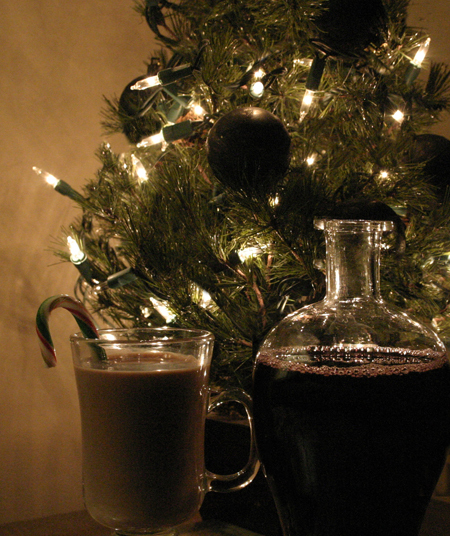 For decorations we had a Christmas tree decorated with the black ornaments that my son painted, photographer here with a bottle of poison (grape juice), and a glass of chocolate milk with a candy cane stir stick. Chalk this party up to one of my most idiotic ideas ever. But a great time was had by all 17 guests. So off I went to the store. 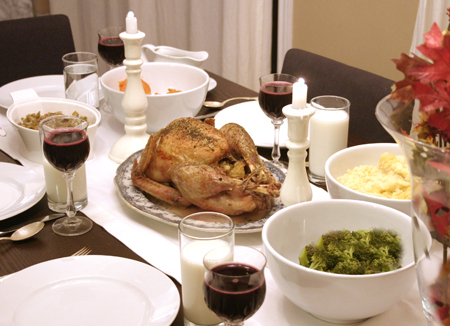 Guess what, you can’t find a fresh turkey Thanksgiving day in Canada. So we had ham. We also had a giant, rock-hard, uncooked turkey in our freezer. So we had turkey for our movie night with another pumpkin pie the following weekend! We also served broccoli, sweet potatoes, stuffing, and neeps and tatties (turnip and potatoes). 2.Add the sugar gradually to the pumpkin puree. Beat well an stir in the flour, salt and spices. Stir in the corn syrup and beat well. Stir in the slightly beaten egg, then slowly add the evaporated milk, mixing until well blended. Pour the batter into the unbaked pie shell. 3. 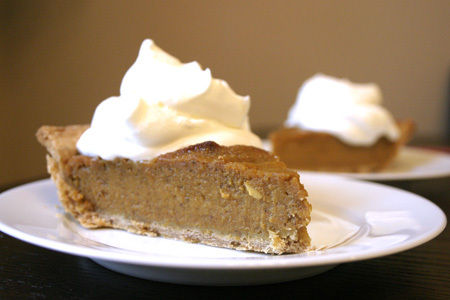 Bake at 230˚C for 10 minutes then reduce the oven temperature to 165˚F and continue baking pie for an additional 30 minutes or until a knife inserted into the mixture comes out clean. 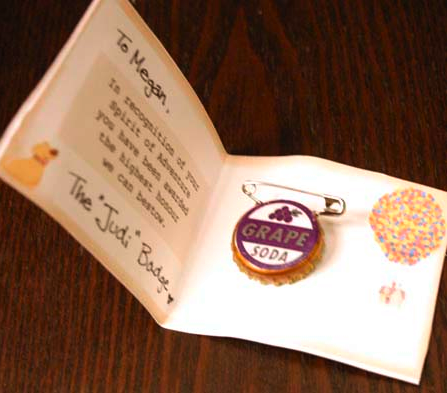 For the craft, I had the kids do travel tags with Mister Toad quotes from the movie. 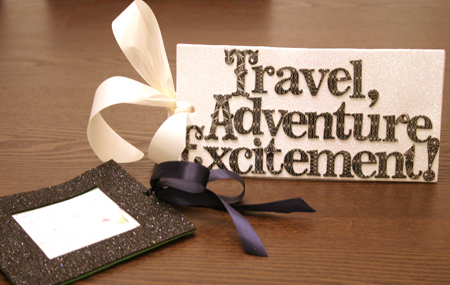 “Travel, Adventure, Excitement!” and “We’ll go for a jolly ride!” I got sparkly foam and scrapbook letters and the kids did the lettering. Then we cut out a frame square on one side and the kids inserted their contact info and coloured in a little sketch of Toad I did. Plus since we just moved it was good to help teach them their new info. Perfect for their luggage for Disney, attached with a distinctive ribbon to help find the luggage quickly at the airport! By the way, the letters kind of seem like there is no way they will make it through customs without popping off so I am going to take these to laminate before we go. 1. Soak the rice cake in cold water for 30 minutes. 2. Marinate the beef in the salt, sesame oil, pepper, sugar, and minced garlic for an hour or more. 3. Saute the beef in a skillet, then set aside. 4. Put the water and dashi in a pot. Bring to a boil, then reduce to a simmer for 5 minutes. 5. Add the rice cakes and the dumplings to the broth. Bring to a boil, then reduce the heat to medium. Cook for 10-15 minutes, until tender. 6. Add the green onions. Pour the egg in a little at a time. Let it set a bit, then stir- if you stir right after adding the egg, the broth gets milky. 7. Put into bowls and garnish each bowl with some beef and some crumbled seaweed. For the craft we made a dragon in honour of Mushu (one of my favourite characters). You can find the instructions here but I’ve outlined it below as well. 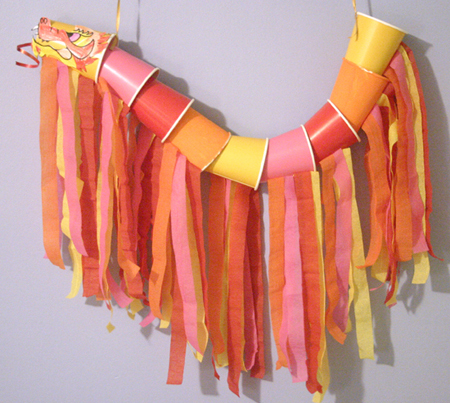 You need coloured paper cups and crepe paper from the dollar store, an old cardboard tube, string, glue, stick, pencil crayons or markers, and a dragon head. You can print one or design your own. You can get everything you need at the dollar store for a few bucks. Punch a hole into the base of each cup with a pencil. Cut the tube into pieces about 5cm long. Tie a large knot into the string and thread it into the cup and out the bottom. Next, thread on a piece of tube and alternate with cups and tubes until it reaches the desired length. Tie a large knot in the end of the string to secure the cups. Draw and colour two dragon heads and stick them to either side of the first cup. 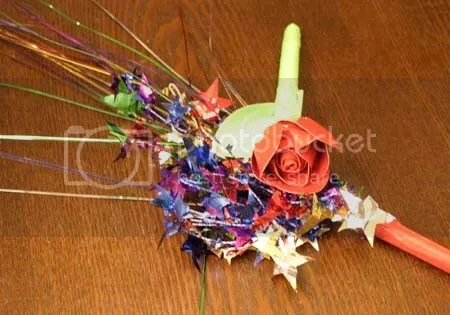 Cut the crepe paper into lengths of approximately 30cm. Glue along the length of the dragon’s body. Punch a hole into the top of the head cup and another into a cup toward the end of the dragon’s body. Attach string from the holes to either end of the stick. 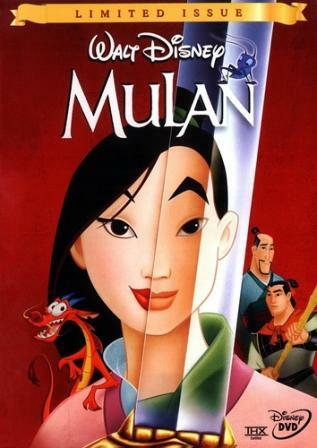 Use the stick to manoeuvre the dragon puppet. 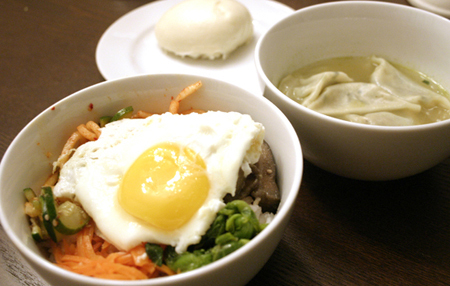 A belated Happy New Year: Sae He Bok Mani Ba Deu Se Yo (in Korean) or Gung How Fat Choy (in Chinese)! 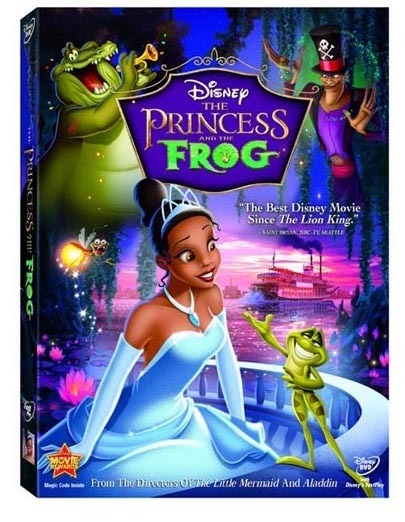 For Mardi Gras we did The Princess and the Frog in it’s honour. 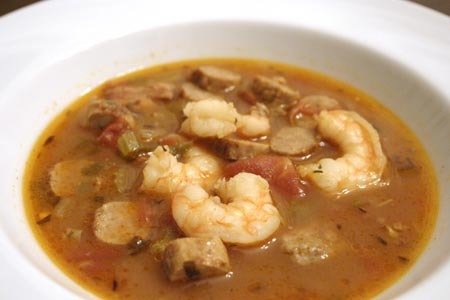 I made Gumbo (first time) and my husband, who HATES shrimp said “No way am I eating that”. Well, my daughter loves shrimp so I said “Fine, more leftovers for her”. 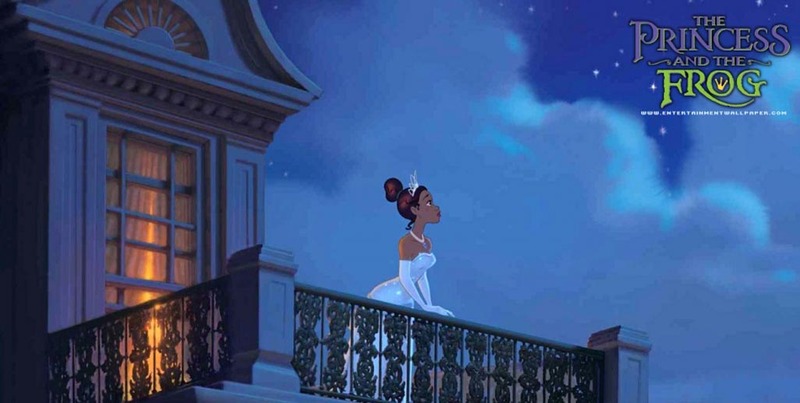 It took me a long time, the roux alone takes 30 minutes, and in the end I think I spent almost two hours cooking it but when I served it it smelled so good that my husband asked for a bowl – and then he asked for seconds! So bottom line, this recipe is so amazing it will make people who don’t even like shrimp forget that they hate it (I’ve included it below). By the way, I cut the recipe in half and it still made buckets of the stuff. Unless you are doing a picnic for the church or something, cut in half. 1. Brown the sausage in a skillet over medium heat, discard the fat in the skillet, and drain the sausage slices on paper towels to absorb any excess grease. Set the sausage aside. Cook and stir the chopped bacon in the skillet until crisp, 6 to 8 minutes, remove the bacon, and set aside. Stir the okra into the hot bacon drippings, and cook and stir until the okra is tender, about 5 minutes. Drain the okra in a colander, and discard bacon drippings. 2. Place the okra and diced tomatoes in a saucepan over medium heat, and bring to a simmer. Reduce heat to medium-low, and simmer the okra mixture for about 10 minutes. 3. In a large soup pot, melt the butter over medium heat, and cook and stir the onion, green onions, green pepper, celery, parsley, and garlic until the onion begins to turn brown, about 10 minutes. Remove the vegetables but leave the butter in the pot. Stir in the flour, reduce heat to low, and cook the roux, stirring constantly, until it turns the color of milk chocolate, 30 to 45 minutes. Do not let the roux burn. 4. When the roux reaches its correct color, whisk in 2 cups of water. Raise the heat to medium; stir in salt, pepper, cayenne pepper, thyme, and bay leaves, bring the mixture to a boil, and stir in the sausage, bacon, okra-tomato mixture, and 6 more cups of water. Reduce heat to medium-low, and simmer the gumbo, stirring occasionally, until the soup has thickened and the flavors are blended, about 45 minutes. Stir in the shrimp, and simmer until they turn pink and opaque, 6 to 8 more minutes. Discard bay leaves and adjust the seasonings, if desired, before serving. For dessert we made Beignets and I left them in the fridge overnight to chill. I found a great recipe here that does not use shortening (my daughter has a soy allergy so we can’t use that.) They were soooo yummy! 1. Using a mixer with a dough hook, place water, sugar, salt, egg, butter, evaporated milk, flour, and yeast in the bowl. Beat until smooth. Remove dough from bowl and turn out onto a lightly-oiled surface. Form dough into an oval, place in a lightly-greased bowl, cover with plastic wrap, and refrigerate until well chilled (3 to 4 hours) or overnight. 2. Roll out the chilled dough on a lightly-floured board to 1/2-inch thickness. Using a sharp knife, cut dough into approximately 3-inch squares, triangles, or circles; set aside. 3. In a large pot, heat vegetable oil to 182˚C. Slide the dough pieces slowly into the hot oil (this is to avoid splattering) and fry the beignets (2 or 3 at a time) approximately 2 to 3 minutes or until they are puffed and golden brown on both sides; turning them in the oil with tongs once or twice to get them evenly brown. 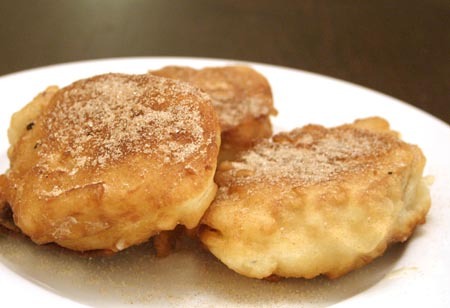 The beignets will rise to the surface of the oil as soon as they begin to puff. NOTE: If the beignets don’t rise to the top immediately when dropped into the oil, the oil is not hot enough. Remove from oil and drain on paper towels. 4. While the beignets are still warm, sprinkle heavily with powdered sugar. 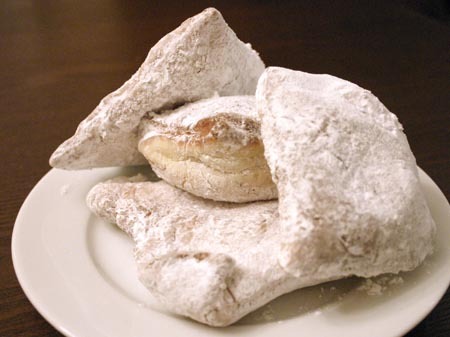 An easy way to coat the hot beignets in powdered sugar is to place the powdered sugar an a clean bag. Add the beignets to the bag, hold bag close and shake to coat evenly. 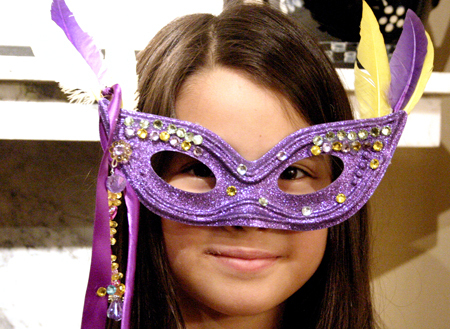 For the crafts, my daughter made a Mardi Gras mask with sparkles, sequins, feathers, beads, and ribbons, hot glued on. All from the dollar store, score! Then she adn her brother painted a little firefly scene. 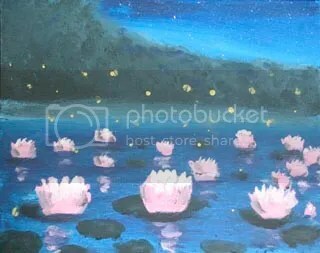 She did the background and her brother did the fireflies with his pinky in some yellow finger paint. 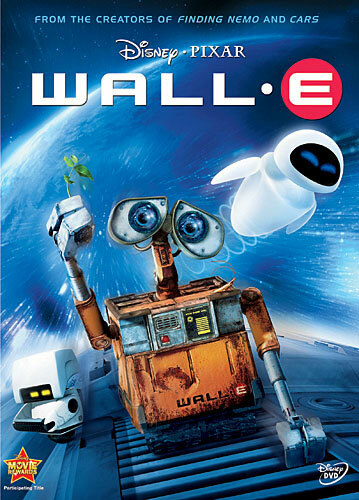 Our Wall-E night was a bit action-packed so we will be watching the movie this weekend instead. I had intended to do it this past weekend but it was the new baby’s 6 month birthday. We had a nice little party with my sister and her family and we gave him solids for the first time (Gerber Baby Rice Cereal Starter) but he had an allergic reaction to it and broke out in hives and his eyes swelled shut. It was terrifying! After 1.25 mL of child’s benadryl and an hour of cuddling he was almost back to normal. 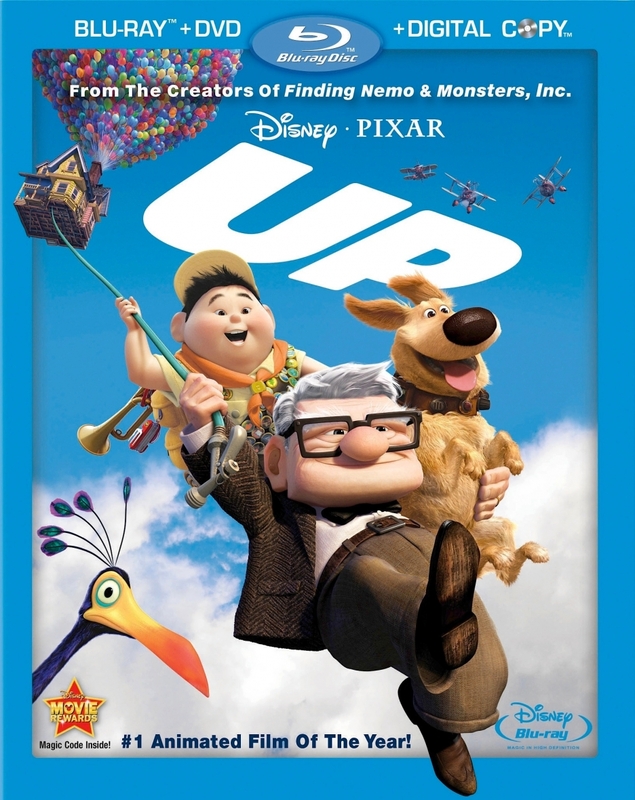 It’s actually relevant to the movie night because even the plain rice cereal baby food is full of extra additives and ingredients you just don’t need. We switched to Healthy Times Organic Baby Rice Cereal today and he had no problems at all. Anyway, for the snack we did Wall-e cookies. 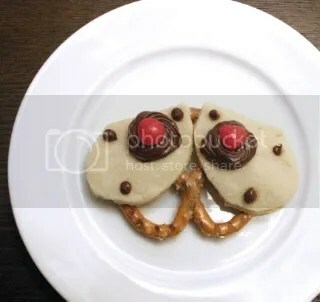 I found a cute recipe here but I simplified it a little and skipped the white icing and just made the eyes and rivets with some chocolate icing and cinnamon hearts. I used my favourite shortbread recipe from here and they still looked pretty cute (Recipe below). 1. For the cookies, preheat oven to 180˚C. Cream butter and sugar until fluffy. Stir in vanilla; add flour and mix well. Flour counter and rolling pin, roll out dough and cut out eye shapes from the template pieces. Place on baking tray and bake for 10 – 12 minutes. Allow to cool completely. 2. Working with one cookie eye at a time, ice an iris with chocolate icing using a piping bag. Add three rivets to the eye piece. Place a cinnamon heart in the centre of each iris. 3. 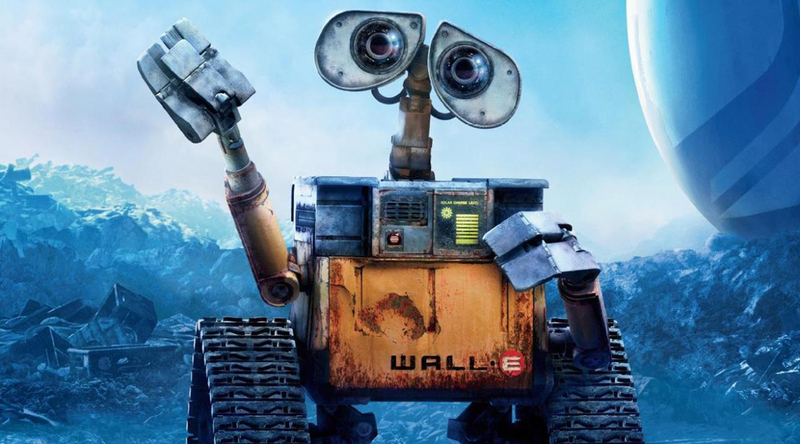 Use more of the icing to attach each completed pair of WALL-E eyes to the top of pretzel. 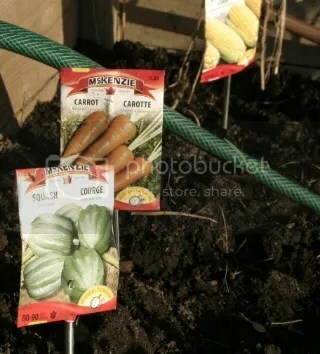 For the activity, first the kids and I planted some seeds and raspberry bushes in the garden that they picked out. We had gone for a tree but they were all pretty pricy. Next year, when we are in our forever home. Then, we picked the garbage off the grass around our house and my son made a sign that said “Happy Earth Day! Don’t Litter Please”. While he was doing that, my daughter was working on researching the oil sands and writing a letter to Steven Harper and our MP asking him to cancel the plans for the Enbridge pipeline. 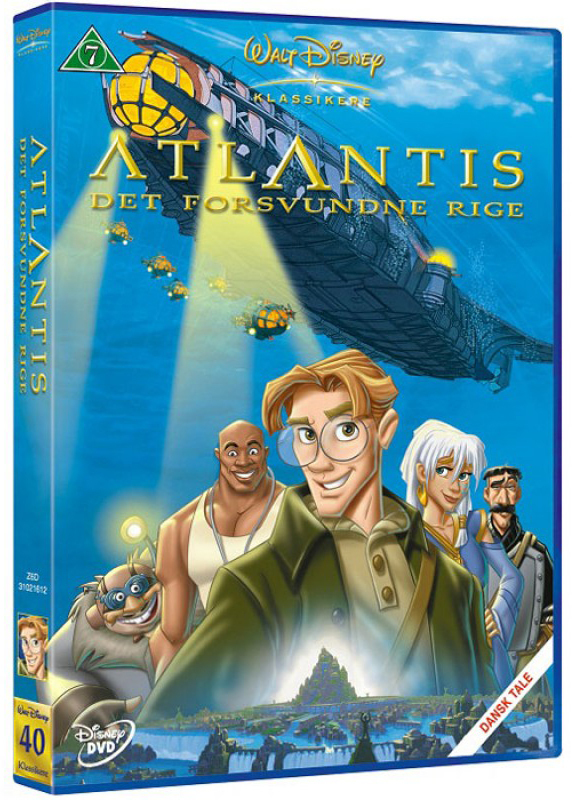 Here is a link to info about it at the greenpeace website. Hope everyone has a great evening! We did a lot of movie nights over the break after Christmas and caught up on a few outstanding crafts. 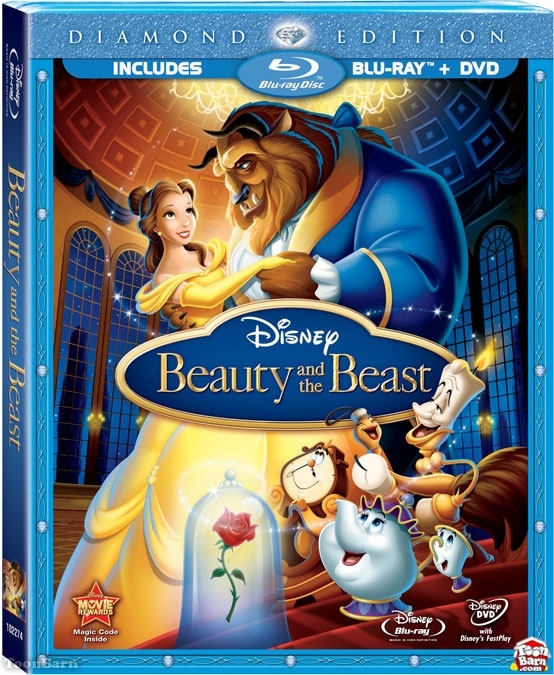 Beauty and the Beast was a new one and perfect for a snowy winter day. We made a cheese souffle for dinner and it was surprisingly easy! It didn’t rise as much as I had hoped and it fell a little for the photo but it was still amazingly delicious. So much so that my carnivore husband asked for it for both New Year’s Eve dinner and his birthday two days later. 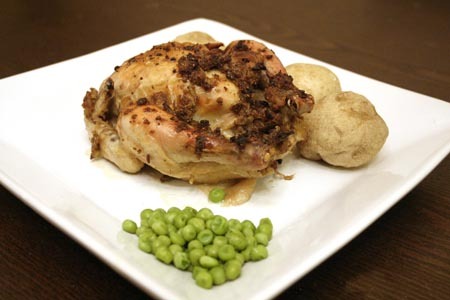 I found the recipe here and I highly recommend it, I’ve posted it below. 1. Position rack in lower third of oven and preheat to 205˚C. Butter 1.5 L soufflé dish. Add Parmesan cheese and tilt dish, coating bottom and sides. Warm milk in heavy small saucepan over medium-low heat until steaming. 2. Meanwhile, melt butter in heavy large saucepan over medium heat. Add flour and whisk until mixture begins to foam and loses raw taste, about 3 minutes (do not allow mixture to brown). Remove saucepan from heat; let stand 1 minute. Pour in warm milk, whisking until smooth. Return to heat and cook, whisking constantly until very thick, 2 to 3 minutes. Remove from heat; whisk in paprika, salt, and nutmeg. Add egg yolks 1 at a time, whisking to blend after each addition. Scrape soufflé base into large bowl. Cool to lukewarm. DO AHEAD: Can be made 2 hours ahead. Cover and let stand at room temperature. 3. Using electric mixer, beat egg whites in another large bowl until stiff but not dry. Fold 1/4 of whites into lukewarm or room temperature soufflé base to lighten. Fold in remaining whites in 2 additions while gradually sprinkling in Gruyère cheese. Transfer batter to prepared dish. 4. Place dish in oven and immediately reduce oven temperature to 163˚C. 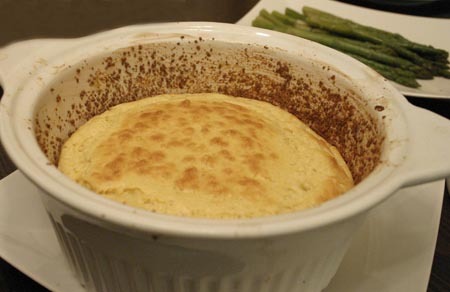 Bake until soufflé is puffed and golden brown on top and center moves only slightly when dish is shaken gently, about 25 minutes (do not open oven door during first 20 minutes). Serve immediately. The craft was actually quite a bit of work but so worth it in the end. 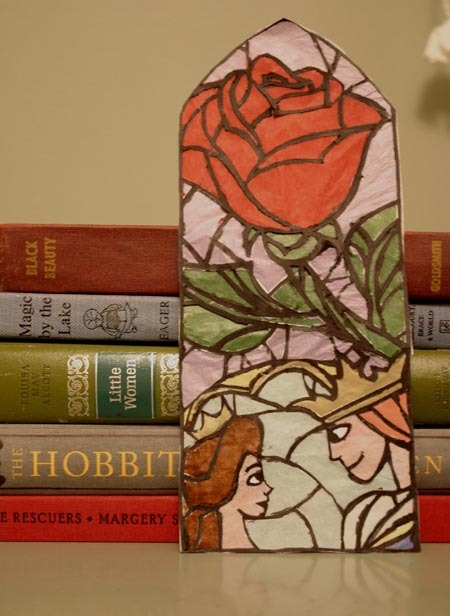 We decided to do a bookmark because both Belle and our family love reading. I found an image here and converted it to black and white. I printed it and redrew the lines in a darker black marker. Then I showed my daughter how to use the exacto knife and she cut out all the white pieces. We then glued scraps of coloured tissue paper to the back and enclosed it all with a piece of white tissue. It turned out so nicely and she was really proud of herself. Here it is with a few of the books on her reading list for 2013. We also started her and her brother up on goodreads so they can record the books they are reading. They have challenged themselves to reading 100 books this year and if my girl does 60 by the trip I told her she would earn a visit to Blizzard Beach. Yes, I am bribing her. Anyone have any good suggestions for books for kids 7-10? 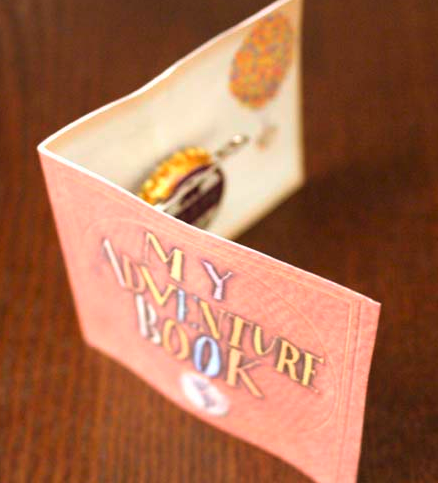 Just a little extra, the kids made autograph book pens. Toby did fireworks with some gift wrap and red duct tape. Eveie took the red and some green as well and made the Beast’s rose.